BMTC are proud to announce that we won the Special Adjudicators Award at the NANDA Awards for our Panto Cinderella ? The adjudicator wondered how we would pull off a Panto in such a modern building with limited space and was amazed at what we did!!!! We also got a special mention for our Costumes. 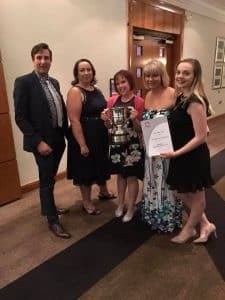 The Nottingham and Nottinghamshire Drama Association (NANDA) serves and represents all the amateur theatre groups in the county and host the awards ceremony each year to showcase and highlight the efforts and talent within the area. The team were presented with a Silver Cup first issued in 1937 and we are all extremely proud to have our name on it for 2018. Special thanks go out to everyone that was involved who made it something to remember! View the Cinderella Gallery here.